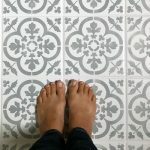 Last week, I shared my plans for our master bathroom, and this week I’m going to change those plans; not all of them, but some. 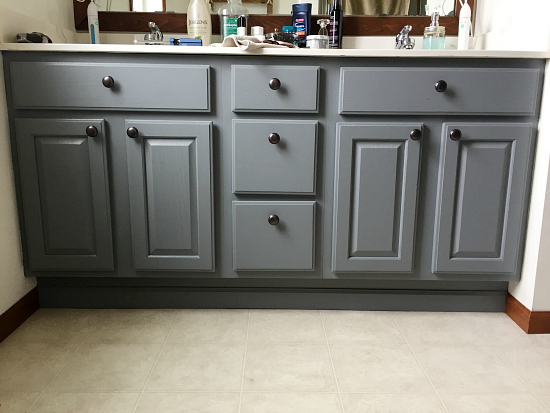 I headed out to buy some satin enamel paint to redo our vanity, and I literally stood in Hobby Lobby for about 45 minutes trying to figure out whether to go with “Dark Denium” or “Smoke Grey” My original plan was to go with a navy, but it was bluer than I thought I’d want… so I went with gray. This, however, changes my wall paint plans. Originally I was going to use some free paint I had leftover from our master bedroom makeover, but I don’t think the color is going to work with this new vanity color… plus, I now remember that it was a flat paint, which is no good in a bathroom anyway. 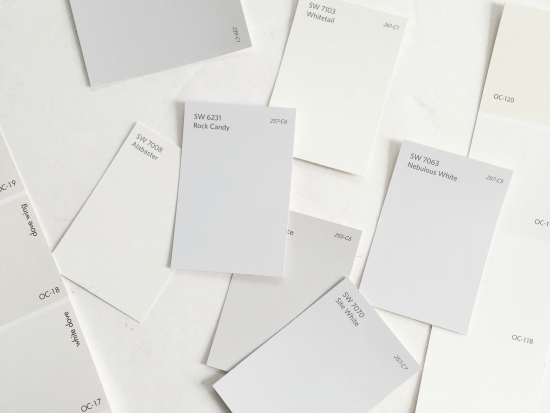 So, now I’m shopping whites… Did you know there are, like, 7,148 different whites in the world of paint? So, I need your opinions on which white I should go with, but hang on because first we’ve gotta talk about the vanity. I have never painted a vanity. Never. I’ve never even painted a piece of furniture… except with spray paint 🙂 . So if I can do this, so can you. 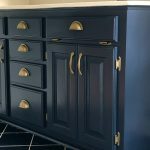 When we did the $100 Room Challenge in January, Meredith, from The Palette Muse, shared how she redid her vanity with satin enamel paint. It is cheap, and I’m thinkin’ I can probably handle this. 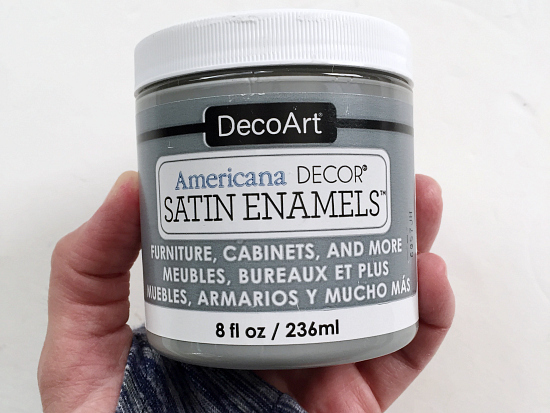 DecoArt Satin Enamel Paint– I used Smoke Grey, but there are more colors to choose from. I’m a person that likes a lot of pictures and details, so I’m going to walk you through the process. In order to get the best paint job possible, you need to remove the doors and drawer fronts on the vanity. When doing this, remember to mark everything. 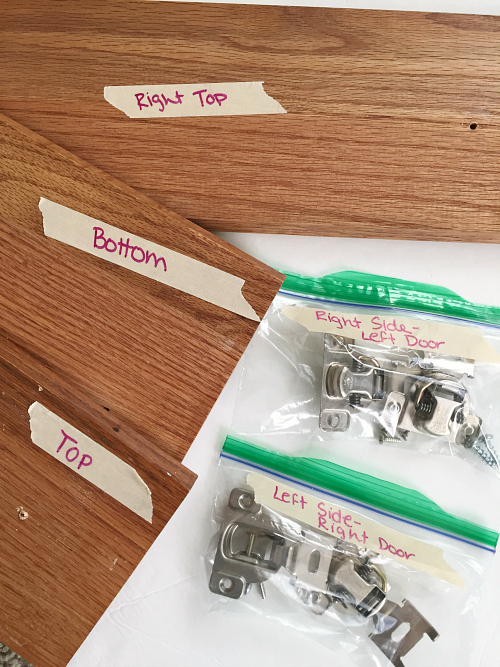 Label every door and drawer with the correct location, and also place the hardware into ziplocs, labeling them as well. First thing’s first. You need to clean the area you plan to paint. I can see some toothpaste splatter on the second drawer, and there’s really no need to preserve that in paint. 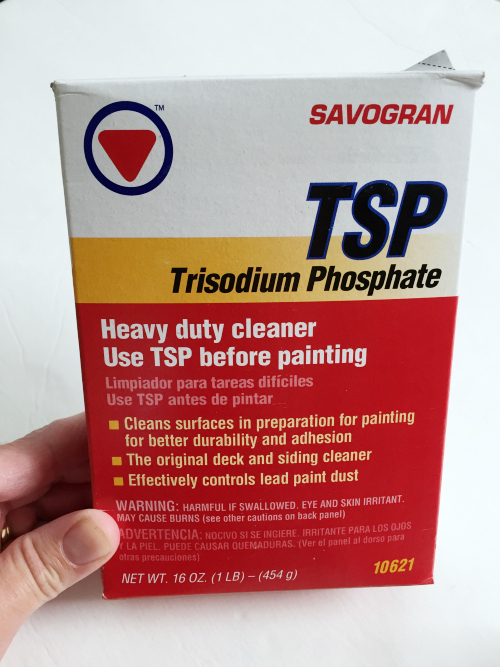 I have heard that TSP is the way to go when cleaning cabinets for painting, so that’s what I got. Following the directions on the package, I mixed 1/2 cup TSP with 2 gallons of hot water, allowing it to dissolve. It is recommended that you wear gloves, long sleeves, and eye protection… so, that’s what I did. (And by eye protection, I mean I wore sunglasses, ’cause I couldn’t find our real eye protection glasses. I’m sure I looked awesome 🙂 ) You simply wash everything down with the TSP mixture, and then wipe it down with clean water. The next step in the process is to lightly sand the vanity, along with the doors and drawer fronts. This allows for the paint to adhere better. After sanding, I did another wipe-down with a damp sponge, and made sure it dried before painting..
As mentioned above, I bought a satin enamel paint. 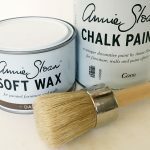 You can use a foam roller or paint brush for applying the paint. Because I don’t like brush strokes, I chose the foam roller. However, for the nooks and corners, I used a small paintbrush. I ended up applying 2 coats of the paint, waiting for it to completely dry between applications. Prior to the second coat, lightly sand one more time. One thing to note is that if there’s too much paint on the roller, you get little bubbles. If this happens to you, gently roll the roller over the area. I when I say “gently”, I mean with the softest touch possible. Then allow everything to dry. 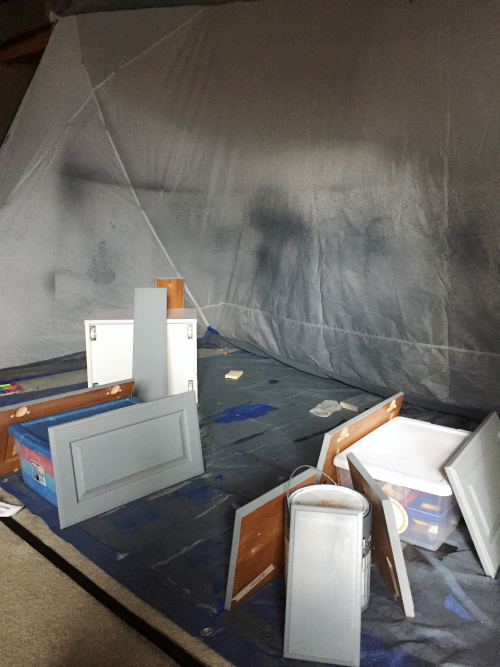 … here are the doors and drawer covers propped up on various totes full of toys, in our basement (where we have our spray shelter set up for the winter 🙂 ). While this is where we left off for the original post, I do want to share what this vanity looks like all finished up… Ready? The above image shows the same swatches with the lights on, again, no editing involved. Do you have a favorite? That’s all for this week… Make sure to check out all the other bloggers that are participating in the $100 Room Challenge using the link-up below. Amazing makeover! Quick question about the vanity paint: how has it held up? I am going to paint my vanity (probably in the same color! ), but worried about wear and tear and moisture/humidity. We have used Benjamin Moore before, but would much rather spend less than $10 versus $50! Thank you! I really love all your $100 dollar makeovers. I have just one concern. In reading about all your $100.00 makeovers you all seam to have free things because you had it on hand. What if you don’t have all that stuff on hand. 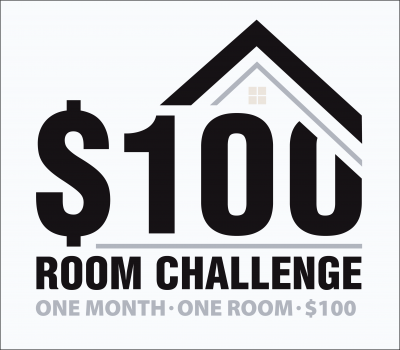 I would love to see a $100.00 room makeover done from scratch. Would that even be possible. I really do love all the rooms they are beautiful. Thank you so much. Hope your day is a happy one. 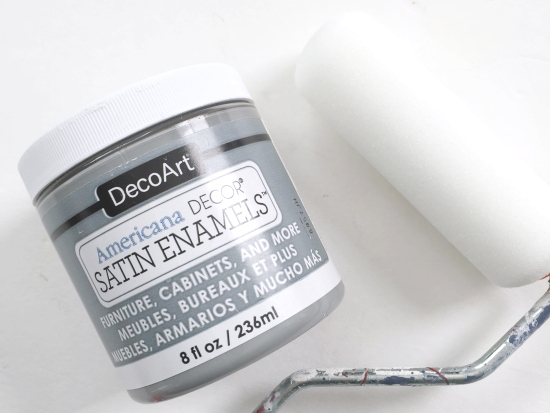 How many 8oz jars of the decoart satin enamel paint did you need for your vanity? Oooo, that cabinet color is so pretty! 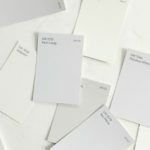 Which ever white you choose it’s going to be fabulous. I can’t wait to see how your space comes together! Thank you so much Ashley! Now that the vanity is back together, I cannot wait to get the walls painted. Wheee! Those polka dots are so fun! It’s going to be so cool! I’m LOVING how the vanity has turned out so far. 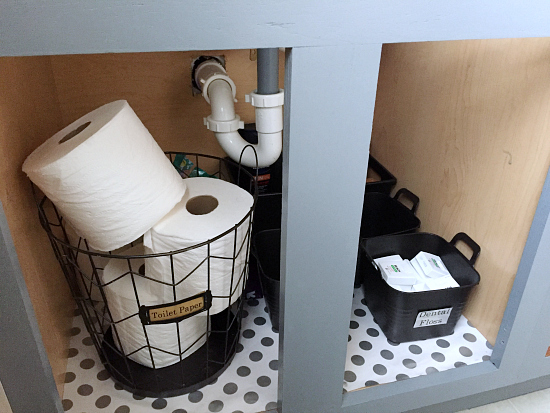 And that polka dot paper in the bottom of your vanity is super fun! I might just have to do something similar… My vote for paint is the Alabaster, but they would both look fabulous. Thanks so much for hosting. I’m looking forward to seeing more of your bathroom transformation. The polka dot paper is actually from the dollar sections at either Target or Michael’s (Can’t remember which one. It’s been there for months now, and I love the little added whimsy. 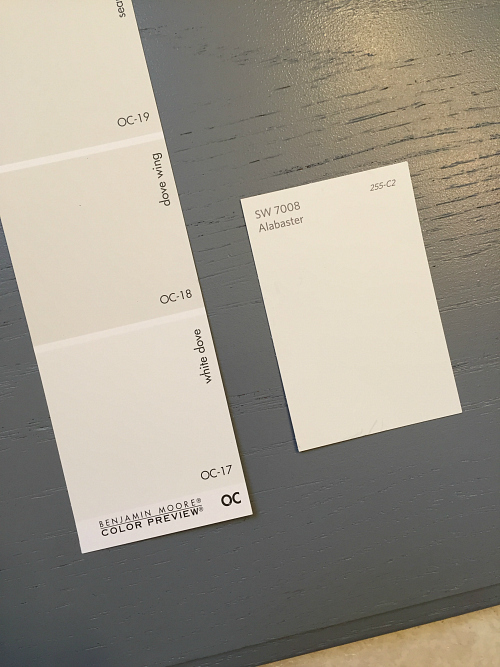 The two whites are very similar, but I have to go with Alabaster as that is what I used in my kitchen and family room. Love it! Always good to hear that people love a paint color they actually have in their home. Thanks for your input. Thanks Linda! Got the vanity back together, but it definitely needs some knobs and pulls. On the list for this week. White Dove definitely. Thanks for bringing all your work to us. I love following your progress! Good luck with the rest I’m sure it will be great. Thanks Jeannette! So glad you enjoy these challenges. It’s been so fun having other bloggers join in to see what other come up with! 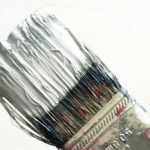 The DecoArt Satin Enamel paint is one of my favorites. 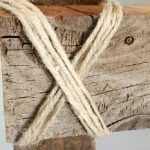 I love love love it and have used it on so many projects! Looks awesome on the vanity! Your vanity turned out great! I’ve never tried that paint before. My vote is for White Dove for the paint. Very nice gray Erin! love it! I like White Dove the best. I prefer the White Dove! The vanity is going to be gorgeous! Erin, this is looking good and thanks for the great tutorial. I just painted a room white dove and I love the color! I can’t wait to see your finished room! Thanks for setting this challenge up! 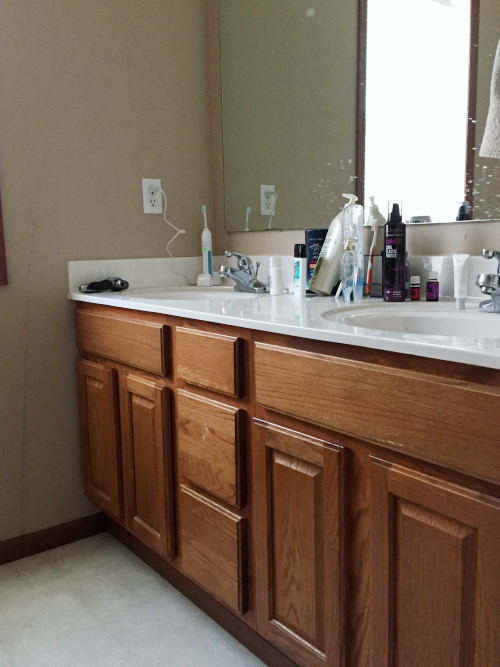 I’m so glad to hear you’re loving the White Dove… just bought a gallon today to get this bathroom painted. I’m so excited! And it is my pleasure to host this challenge. I absolutely love doing it! They don’t look greatly different from the photos, but I’m leaning toward the white dove. It’s looking great so far Erin! 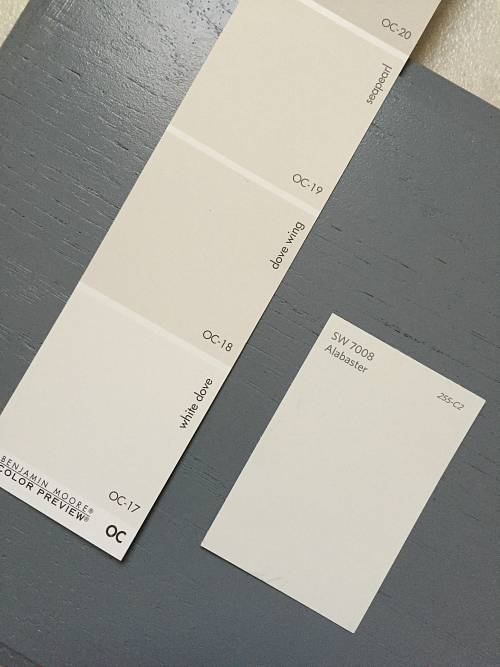 I love the color you chose for the cabinets, and I think I prefer the white dove for the walls. Can’t wait to see more! It looks great! Good job letting the paint cure you wouldn’t want to smear it or anything. And also I agree whites are so hard. I know you’ll pick a good one for your space! I typically rush through stuff ’cause I just want it DONE, but I kept telling myself that it’s best to just wait it out. It’ll get done, and be so much better without smudges 🙂 As for the white paint, I don’t think you can necessarily go wrong… right? I’m feelin’ the White Dove just a bit more myself. You’re absolutely right; it’s crisper. I’m so glad you’re enjoying this series. 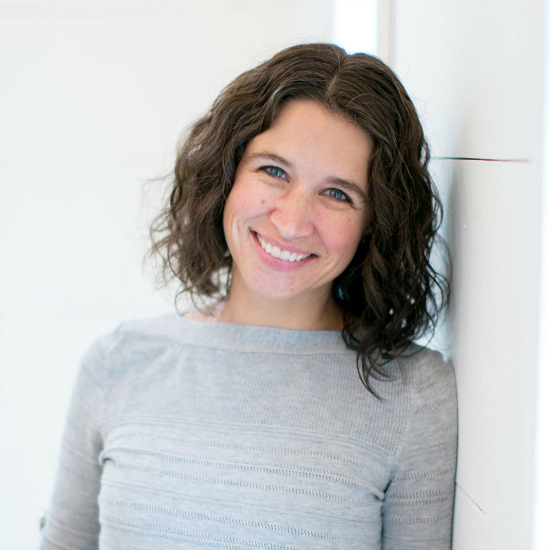 So happy to have you following along!